City of London, Welcome Home! Discover a park just for you! Click here for Parks & Recreation Info. LOOKING FOR A CITY ORDINANCE? CLICK HERE! 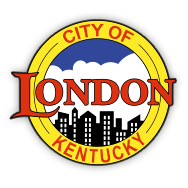 The City of London is located in Laurel County, Ky. With over 8,000 residents, London has been named the Cycling Capital of Kentucky, Kentucky's 5th official Trail Town, has been certified as a Tree City by Tree City USA, and annually hosts the World Chicken Festival. The City of London's rights were granted in the Commonwealth of Kentucky in February of 1836.